Quad O-rings are one of the popular types of O-rings with a double sealing surface. These seals are distinguishable due to their square surface, and can easily resist any spiral kind of twisting. SSP Seals provides quad rings, which are used in various process applications. 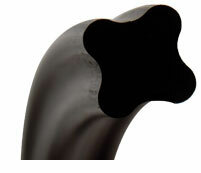 The O-rings cover twice the area than regular O-rings, which provides effective sealing in dynamic applications. These seals help minimize wear and tear of the sealing component and allow users to save on replacements. The cross section helps resist extrusion, as well as twisting. There are two sealing surfaces, which create positive sealing with minimal friction. Our quad rings are available in silicon, Buna, EPDM (ethylene propylene diene terpolymer), FKM (fluoroelastomer), silicone, and Detectomer Buna materials. Our variable material selection allows our industrial clients to select the appropriate O-ring for their application. Following are some of the benefits of quad O- rings, which makes them ideal replacements for traditional O-rings in many applications. These O-rings have a wider footprint, which helps avoid spiral failure that is common in dynamic applications. Most traditional O-rings have flash lines on the outer diameter, however, quad-rings have them on the inner diameter. This helps avoid any effect on the sealing lips. Quad-rings can retain lubricants for more a time than regular O-rings due to the grooves on the inner and outer diameter. To know more about quad rings or vast O-rings we provide, please contact us at the earliest.